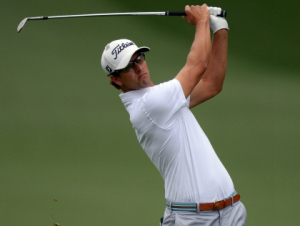 How Many Major Championships Will Adam Scott Win? Ten years ago when Adam Scott won the Players Championship at the age of 23, the world was put on notice that he was the next player to rival Tiger Woods. His swing was simply too perfect for there to be any outcome otherwise. But unfortunately for Scott, there were a few things that held him back. On the golf course, it was his putting. Off the golf course, it was a lack of the necessary preparation. But it wasn’t as if Scott didn’t win. He had eight-career PGA Tour victories prior to his 2013 Masters triumph last weekend. Though with the game that he appeared to be capable of it was an underachievement. All that was put to rest on Sunday when Scott won the first Major championship of his career. We all thought it would come last July at the 2012 British Open, but a heartbreaking back-nine on Sunday prevented that from happening, and Ernie Else came away with his second Open Championship win. But as we look ahead in Scott’s career, at just 32 years old he still has plenty of Major championships out there to be played. And conventional thought is that a professional golfer does not come into his prime until his mid-thirties so theoretically Scott’s best golf is in front of him. Next up will be the U.S Open in June from Merion, followed by the British Open in July at Muirfield. You can bet Scott will be a topic of conversation at both, but especially at the Open Championship where he let a big lead over the final few holes slip away. The victory at the Masters has given Scott the evidence he needs to show that he can make the big putts, and win Major championships. Do not expect the 2013 Masters to be the only Major win over the course of his career. In fact, we expect him to get several. Ben Hogan didn’t start winning Majors until he was 37, and he walked away with nine. We think that Scott could be similar to that, winning his first at 32 and then going on to win three, four, or five more. Don’t expect that to be his only victory in the Masters either. He has shown the ability to really compete on that golf course, and he will continue to be in contention for years to come. This entry was posted in Opinion and tagged 2013 british open, 2013 masters, 2013 u.s open, adam scott on April 17, 2013 by Bryan.